Another long race recap comin' at ya. I called myself a triathlon after my very first triathlon, but now that I've completed 5 I feel like I can now call myself an experienced triathlete. Note that experienced ≠ expert! I'm definitely not a novice anymore. I still do things wrong sometimes but I at least know most of the rules. I had sneakily convinced both the Farmer and my brother to do this triathlon. And by convinced I told my brother (Jared) that I bet he couldn't do it so then he HAD to prove me wrong (as long as I provided the registration fee). Sunday morning started off at 5:42 am when my alarm went off. I slept pretty good that night and feel asleep fairly quickly without all the tossing and turning I usually have before a race. I had all my stuff packed up the night before to cut down on the chaos in the morning and so all I needed to do was put on my race kit, braid my hair and eat breakfast. I had stayed at the Farmer's the night before so I could sleep in a real bed instead of on my parent's couch and told my brother we would be there at 6 am to pick him up. Of course, at 6 am, I am dressed, have half my hair braided, and ready to go and the Farmer just starts making coffee. Grrr. I'm not one for talking much in the morning and didn't want to nag at him because I knew he would get irritated with me so I decided to just eat my trusty peanut butter, banana, and toast breakfast there. My mom called me to ask where we were since my brother was waiting so I tried to unsuccessfully rush the Farmer along. We didn't end up leaving till about 6:15! I tried to stay calm but I really like to be early for triathlons since there is so much to do to set-up. Once we arrived at my parent's house, I finished braiding my hair while the Farmer put Jared's bike in the car. I made sure we all had what we needed before heading to the race site. 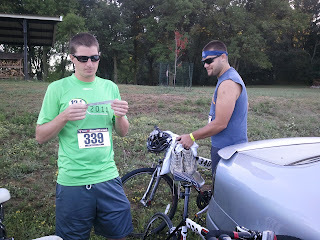 A quick 20 minute drive later, we were unloading our bikes and walking to transition. Since this is a small triathlon, we were able to rack our bikes together. Our little group did a short warm up run and some stretching before hitting the bathroom and then walking over to the pool to pick up timing chips and get body marked. We were able to get into the pool to do a little warm-up swim (me), swim for the first time in well over a month (the Farmer), and swim for the first time since he quit swim team over 5 years ago (Jared). The group got out of the pool around 7:30 and I sat for awhile to take some time to myself to prepare mentally. Even though this was an "easy" race when compared to a half Ironman I still get a little nervous and it helps to take some time to chill and visualize success. Yes this is super corny but it helps me. For the past two years of this race the swim has been at Jones County Central Park and then the bike portion is from Central Park to Camp Courageous. It makes for a kind of hectic morning with two transition areas and having to take a bus to the swim start. So this year the event was being held totally at Camp Courageous with the swim supposed to being held at the brand new Lake Todd. Unfortunately Mother Nature didn't get the memo and with an extremely dry spring and summer the lake is still pretty empty which meant a serpentine pool swim. Not ideal, but I'd say the whole thing went over very well thanks to the race director and volunteers. At about 7:45, we all started lining up with our swim pace groups. The Farmer, Jared and I split up at this point as I was swimming with the 1:40 pace group (100m time) and they were headed for the 2:10-2:20 pace. It's pretty hard to know your pace time when you've only swam once or never but they just joined in. We were supposed to estimate our 100 meter pace time for a 300 meter race but since I swim in a 25 yard length pool I wasn't sure which group to choose. My pace for a 300 yard swim was somewhere around 1:35-:137 per 100 yards, but that's with a swimsuit and not a dragging tri tip. And yes I can really tell the difference. The Farmer after his goggles bit the dust. After a quick pre-race meeting the race started and athletes were released in about 10 second intervals. I was near the front of the pack so it wasn't long before I was running across the timing mat and jumping into the pool. I ended up passing the girl in front of me in the first length of the pool and passed at least 2 others throughout the swim as well. The swim went by pretty quickly and was over before I knew it. It was 0.2 mile run from the pool to transition area on cement so I took off at a fairly easy jog over there. Once I was in transition it was a quick change to dry off my legs, put on socks and bike shoes, helmet, sunglasses and race number. Then it was off for the bike. The bike was an out and back on 3 different roads. The road seemed fairly empty--most likely from the spread out swim start and I passed a few people and was passed by others. Typical. The ride out was fairly uneventful. A few hills, but nothing too challenging. The ride back in was were it got interesting as we spent about 4 miles riding straight into a headwind. Riding into headwinds can be so defeating. You are pedaling hard on your bike but your speed stinks. I did manage to see both the Farmer and Jared on the way back. I yelled for both of them. The Farmer looked like he was riding at a fairly hard effort level but my brother wasn't. He yelled "Go Alyssa!" as I passed by and didn't sound out of breath at all! When I was comparing my speeds from this triathlon to the half Ironman, I realized my bike was only .3 mph faster (17.54 mph for half Ironman and 17.8 mph for this race). I felt like my effort level was much higher so that just goes to show how much more challenging the bike was. I had a little trouble dismounting the bike and I need to learn how to do it with my bike shoes. I honestly never practice transitions, but I probably should. Then I was heading down the huge hill. I'm sure my pace was awesome at this point because it was so much easier letting gravity do the work. It was a loooong way down and I was already dreading the trip back up. Once I got to the bottom there are just two short loops before running up the hill. I knew I couldn't run all the way to the top but I started with the goal of making it to the water station. That didn't happen so I just alternated between running and power walking. Once I got to the top I started running again. The run course goes by fairly close to the finish line and then winds back through more trails for about the last half mile before shooting out towards transition. I tried to push my pace and looking back I wish I would have pushed more because I didn't feel very tired at the end. Near the finish line I tried to sprint to cross the line, but honestly wasn't that fast. After the finish I collected my new water bottle and turned in my timing chip. They have a timing tent right after the finish line so I got a print out of my times! Then I met up with my mom and my grandma to wait for the Farmer and my brother to roll in. The Farmer was first and Jared followed awhile later. I told you he wasn't working very hard on the bike! They ran and I snapped pictures of them! The Farmer finished first and Jared crossed the line a bit later. After resting a bit and cheering on some other Cascadians we headed to the lodge for post race breakfast! There was no shortage of pancakes, sausage, scrambled eggs, potatoes and fruit! The pancakes were seriously delicious! It's been quite awhile since I've had a pancake and these did not disappoint. Also of note the watermelon. I'm not usually a huge fan of breakfasts like this but it was good (maybe because I was so hungry?). The award ceremony was next. I managed to sneak away with 2nd place in my age division for the second year in a row!